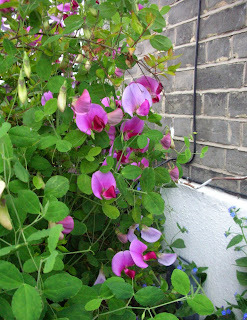 The sweet peas in our front garden are in their full glory this week - they smell lovely! 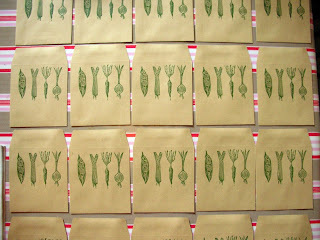 Last week we finished off the seed packets that we started printing earlier in May. 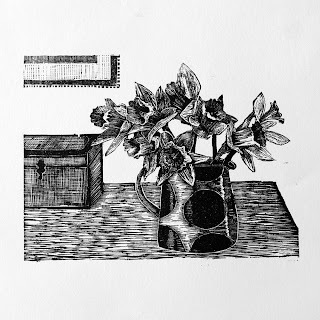 We finished them off with 'seeds' printed in 24pt Plantin underneath the little linocut - leaving plenty of space to write names, dates and notes. 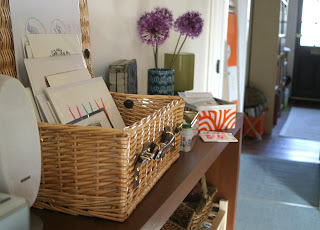 In the background is my new orange Nutscene twine - I can't live without it. Well, I can, but the garden would be a sadder place without it. 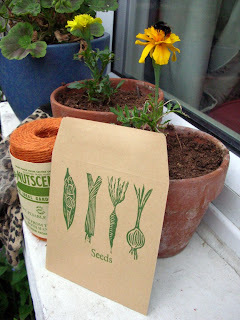 The seed packets are available in our Etsy and Folksy shops now. 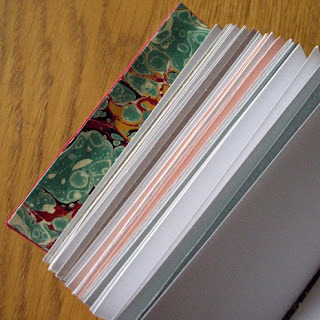 You can also win a little package of printed goodies by taking part in a short survey about buying artwork for a course I'm doing at the moment. If any readers have time to take part, I'd be eternally grateful! 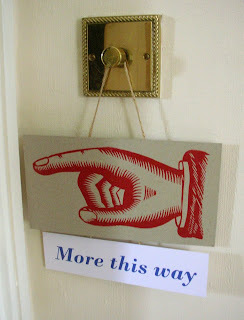 Otherwise, we are gearing up for another jolly weekend of Open Studios! 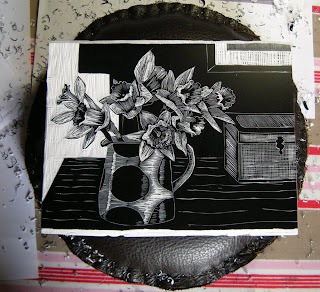 Well, our first weekend of Norfolk Open Studios has now been and gone! 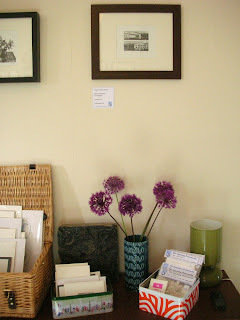 We had such a great weekend with a steady stream of visitors, most of whom stayed for a nice long chat and some tea. 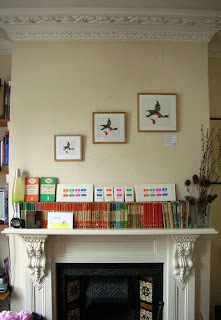 The chimney in the front room is adorned with a framed set of Flying Ducks (as well as the inevitable Penguins). ...where they found a table full of materials, assorted bits and bobs as well as the Adana. 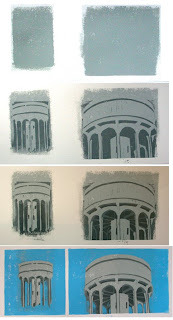 We did a little demonstration for a few visitors, who had a go on it too and took their prints home with them. Thanks to Celia, Andy and everyone else who came along to say hello! And we're doing it all next weekend as well! But before next weekend's excitements we've got a busy week ahead of less than exciting things (like the enormous pile of ironing that's been ignored during the run up to Open Studios....). Tomorrow is the first day of Open Studios for us! We have spent a couple of busy days getting ready to open our doors. You can see a map of how to get here on our artist pages on the Norfolk Open Studios website - click here! Parking on our street is for permit holders only, but there are some 'visitor' spaces at the top of the hill, and at the bottom (outside the fish and chip shop). Do come and say hello if you're in Norfolk. If you can't make it this weekend then don't worry - we're doing next weekend too! New project - seed packets! 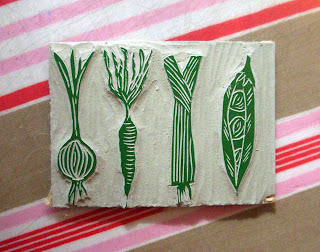 This weekend I've been working on a little linocut of some vegetables to print onto some little envelopes. Our garden peas are racing up their pyramids, and the sweet peas started flowering this week too. We need to get lots of our seedlings planted out too, especially our climbing courgettes - we just need a dry afternoon! 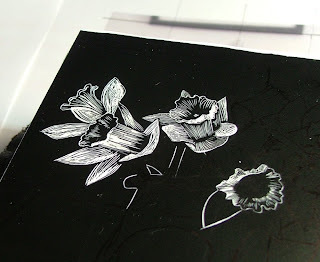 The next stage will be to letterpress some text onto the envelopes to turn them into proper little seed packets. 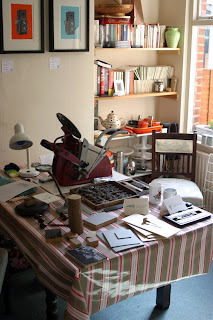 This weekend was the start of Norfolk Open Studios. We are doing the next two weekends, and we're quite excited about it! We'll post some more details about how to find us this week. 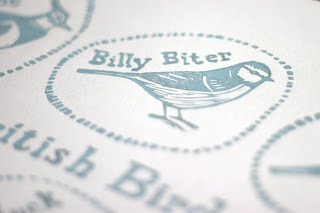 Last week Jon finished a new linocut - British Birds! Each little bird is paired up with his colloquial name. Naturally, we had to include a hornpie. I love the blue Jon has printed this in, very Farrow and Ball I think. 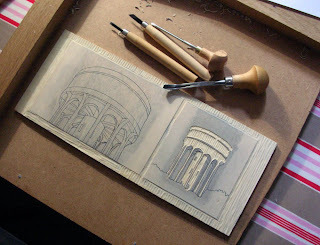 Here is the block, halfway through cutting - lots of fiddly backwards lettering for this one. Fortunately Jon has a steady hand! 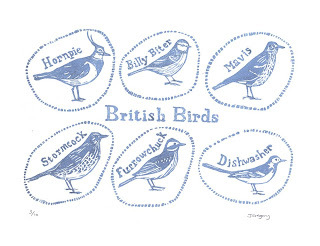 There are prints of British Birds in our Etsy and Folksy shops now. The first person to leave a comment guessing the 'real' name of each bird will win a selection of Lapwing Printworks cards and the like! EDIT: Well done Fibrespace for guessing them all correctly! I'm going to go and eat some more ice cream now - I had my wisdom teeth out this morning - so no solids or hot things for two days. I'm desperate for a cup of tea. 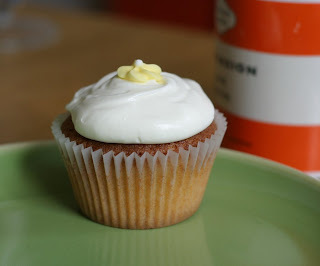 This morning I made some delicious little elderflower cupcakes with pretty white icing and little yellow sugar flowers. Yummy and very cheerful! We need cheering up because last night my desktop computer's hard drive failed! Fortunately, the most important things like theses and wedding photos were backed up elsewhere, but we have lost a lot of files. 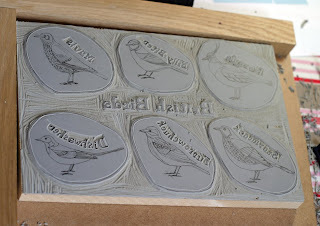 Most upsettingly, all of our Lapwing Printworks files! Anyone who sells their work (online or offline) will know the joys of a finely crafted stock spreadsheet with a myriad of colours for what's been sold, and which things are in which shops. Not to mention all our accounts and things like that. All gone! Anyway, enough doom and gloom! 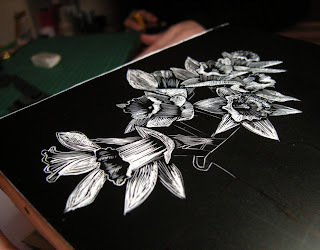 Tomorrow - a new print and some exciting things that have been arriving in the post! 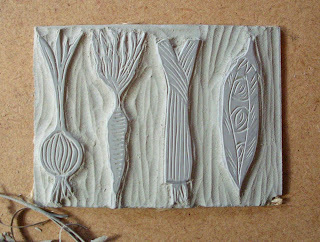 It's May Day bank holiday today, and we've spent all weekend busily carving and printing ready for Open Studios. This one has taken a fair few recuttings and proof printings to get it just right. The little spotty jug is from Ark in Cambridge, and is often filled up with flowers. Of course, they are in our Etsy and Folksy shops now! 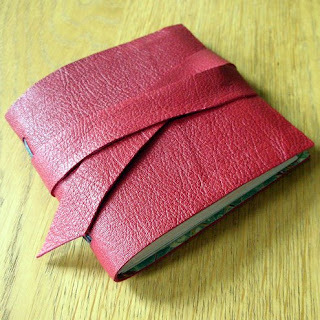 This weekend we had a go with our new book-making leathers - the result is one nice red leather journal, with some more gorgeous marbled paper inside.